Photographers – Abertillery and District. It’s generally accepted that the photographic procedure was introduced in 1839, this date is seen as the birth of photography. There were not many early photographs taken in and around the Abertillery district. The earliest I have seen is a very old image of Cwmtillery Colliery showing the old wooden headgear and the S.W.C.Co. South Wales Colliery Company trucks in the sidings being filled with coal (the image can be seen on this site in the Cwmtillery Colliery section) Messrs Lancaster & Spier took control of the colliery in 1888 so the image is before that date. Professional photography seemed to appear in the late 1880’s in the larger towns like Newport and Cardiff with the professional photographers Bevan & Barnaby, 10 Tredegar Place, Baneswell Road, Newport. Messrs A & G. Taylor of High Street Arcade, Newport and Messrs Dando & Sons, 47 Commercial Road, Newport advertising in papers. The most common style and sizes of photographs taken and available to purchase were as follows – Carte-de-visite’s (small size- 2 and a half inches by 4 and a quarter inches, same size as the visiting cards, hence the name) and the Cabinet (a larger size – 4 and a half inches by 6 and a half inches, for display in cabinets and such, hence the name). There were other sizes in between and larger though they were not as popular. These early images were photographed and developed onto thin paper, which was then glued to thick card, the card showed the name of the individual photographers name at the bottom (right) face with the address and other details on the reverse. Messrs A. & G. Taylor. In March 1890 Messrs A & G. Taylor of High Street, Newport announced they were moving to Wesley Chambers, 157 Commercial Street, Newport and that their advertisement stated their business were the “largest in the world” at that time. In July 1890 Mr John Shirvington, photographer was advertising from his studio near Brynmawr Railway Station, Brynmawr, Brecknockshire. Mr Shirvington only advertised he took Carte-de-visite’s and they cost 5s. per dozen, this was the equivalent of about £30.00 in today’s money. This price wasn’t too bad compared with photographers price lists of today. In 1891 Mr Joel Smith had a photographic studio’s at Mitre Street, Abertillery. 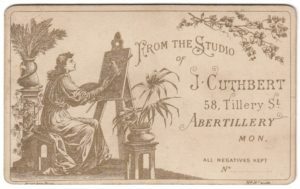 In 1891 Mr Joseph Cuthbert had a photographic studio’s at 58 Tillery Street, Abertillery. Mr Cuthbert was from Port Gordon in Banffshire, Scotland. He initially came to Cardiff but later moved to Abertillery, he worked as a clerk in the offices of Powell’s Tillery Co at Penybont Colliery and married Miss Elizabeth Drew, daughter of Mr Dan Drew the Blaina licensee. Mr Cuthbert left the colliery and set up in the photographic business, he was one of the leading photographers in the area. A short while later he took photographs of the officials and dignitaries at the “cutting of the sod” ceremony at the opening of the Six Bells Colliery in 1891. He was also a member of the Abertillery Orchestral Society of which he was secretary. In 1892 Mr H. Shirvington (don’t know if his initial, was a miss-print as he only had one advert) though he advertised that he had a photographic business in Market Street, Abertillery. Mr Shirvington’s price list was – Carte-de-visite’s 5s. per dozen and that he would pay return train fare from Abertillery. In 1893 Messrs Dando & Son’s Newport issued their price list as follows – Carte-de-visites 4s. 6d. per dozen and Cabinet’s 10s. 6d. per dozen. In the late 1890s Mr William Taylor set up a photographer business at Crumlin, Monmouthshire. Also in the late 1890s Mr Ingram’s was the proprietor of the American Photographic Studio’s at Brynmawr, Brecknockshire. In December 1898 it was reported that his studio caught fire and was burnt out. In April 1899 Mr T. H. Prichard Chemist at Abertillery was advertising that he was selling all the requisites for photographic apparatus and chemicals at his shops in Abertillery and Blaina. Messrs B. C. Peters Bros. 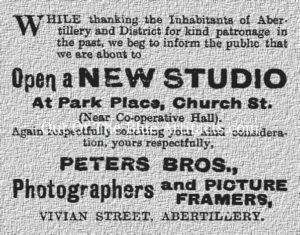 In October 1901 Mr Burt Charles Peters (B. C. Peters Bros) opened a photographic studio at Park Place, Abertillery (as seen on the advertisement right) and was reported to have an annex at 15 Church Street, Abertillery. Mr Burt Charles Peters (Photographer) lived at 19 Oak Street with his brother Mr Samuel Thomas Peters as “visiting boarders”. They both come from Whatley, Somerset and upon coming to this district had a small temporary studio in Vivian Street, Abertillery. 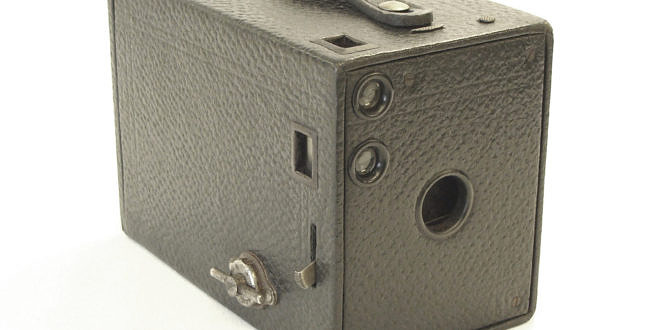 As the photographic business really got underway the firm of Eastman Kodak made small commercially available camera’s. The Brownie Box Camera (as seen in the main featured image above – circa 1901-1929) was put into production in about 1901 along with this amateur introduction to photography many chemists followed Mr T. H. Prichard and started to stock the requisites and chemicals required for the new hobby. In July 1902 Mr E. Price M.Ph.Sc, Chemist at the Central Drug Stores, the Arcade and Somerset Street, Abertillery advertised he was selling all the required items for photography. In 1904 Messrs Williams & Williams, professional photographers set up business in Church Street, Abertillery. They must have took over the old Peters Bros Studios as the latter disappeared from all reports after this date. The photograph (as seen left) is of my grand-mother Mrs Edith Mary Pinkett nee Wilkins of Blaina. Her father Mr David Wilkins was a clerk to Messrs J. Lancaster & Co, Blaina. 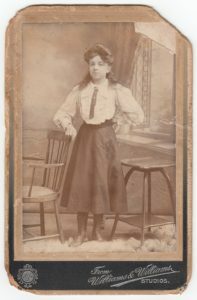 She had the image taken in Williams & Williams Studios, Abertillery in about 1908. The image is a Cabinet photograph. In June 1905 Messrs A. & G. Taylor of Newport opened a Studio at Brynmawr. Again they must have took over the business of Mr J. Shirvington as they advertised their address as being near the railway station, Brynmawr. Their opening “special offer” was four photographs and one frame for 5s. 6d. In July 1905 the Alexandra Photographic Company, Six Bells set up business at premises adjoining the Cwm Hotel, Abertillery. In November 1906 Boots Chemist at Newport advertised they were selling all photographic requisites. In 1907 Mr D. Owen was listed as being a picture frame maker with premises at 76 Carlyle Street, Abertillery. Also listed in the directory of the same year was Mr J. Price, picture frame maker of 33 Oak Street Abertllery. The latter premises were turned into a dental institute by 1910 or earlier. By 1907 Mr Joseph Cuthbert of 58 Tillery Street had moved to his new premises “Gordon House” at 23 Alma Street, Abertillery. He and his wife must have named their new house after the town of Port Gordon where Mr Cuthbert was born. In 1907 Mr A. L. Cranch appeared in Six Bells, Abertillery. Mr Archie Lovell Cranch was the son of Mr Richard Cranch an overseer and Ellen Cranch both natives of Middlesex, London. The Cranch family lived at 4 Whitecross Street, Monmouth. Mr Archie Lovell Cranch married Miss Elizabeth Miles, daughter of Mr Phillip H. Miles a native of Gillingham, Dorset, later a police constable based in Monmouth at 7 Agincourt Street, Monmouth. Mr Phillip H. Miles later left the police force, came to this district with his daughter and son-in-law and became the compensation officer for the Messrs Lancaster Company. In 1910 Mr Arthur Tilney had a photograph studio for sale at Carlyle Street, Abertillery. This must have been Mr D. Owen’s old studio’s from 1907. In 1914 Mr Thomas Fox had a photographic studio at 75 Alexandra Road, Six Bells, Abertillery. On the 3rd November 1916 Mr A. L. Cranch of 42 Alexandra Road Photographic Studio’s, announced that he was to become a radiographer under the War Office and was giving up his business for the duration of the war. He stated that Mr H. N. Bathe R.F.A., was to take over the Six Bells Studio’s until his return. I don’t know if Mr Cranch actually came back to Six Bells though he was living in Neath in 1922 and later Cardiff. He had made many photographic plates and slides of memorable occasions in South Wales. In 1920 Mr Thomas Fox moved to 83 Alexandra Road, Six Bells, Abertillery. In July 1920 a meeting was held at Church Institute, Blaina with the intention to form a camera club at Blaina and the upper portion of the valley to be called the West Mon Camera Club. The following officers were elected – Committee, Messrs S. W. Williams; T. Griffiths and H. S. Summerhill: Mr H. E. Prichard (Treasurer) and Mr E. A. Williams (Secretary): Subscriptions were 10s. for gentlemen and 5s. for ladies. It was said that 50 people had become members of the club. A series of lectures were given by Mr W. D. Thoburn at the Tilers Arms, Blaina. The Abertillery Camera Club and Photographic Society. On Thursday 30th September 1920 a meeting was held at the Station Hotel, Abertillery with the intention of forming a camera club or photographic society. On the 7th October 1920 the Abertillery Photographic Society was formed and held a meeting at the Railway Inn, Abertillery. Mr W. L. Williams presided; Mr C. H. Davies (Chairman); Mr W. A. Bolingbroke (Secretary) and Mr G. T. Jones was (Treasurer): At the meeting it was proposed to set up the camera club in the Railway Inn and to acquire a dark room at the premises..
On Tuesday 26th October 1920 the Abertillery Photographic Society held a meeting at the Railway Inn, Abertillery. Mr W. L. Williams presided; Mr C. H. Davies (Chairman); Mr W. A. Bolingbroke (Secretary) and Mr G. T. Jones was (Treasurer): At the meeting Mr William Brace consented to become their president. It was proposed to set up art classes in conjunction with the photographic society and to also have painting, sketching and modelling classes taught by Mr J. Dixon Esq and Mr W. Lloyd-Davies Esq. Classes were to be held every Thursday at 7.30pm and there were 100 members to date. 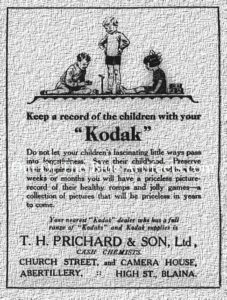 In December 1920 T. H. Prichard, Chemist, advertised he had acquired a new premises called “Camera House” Somerset Street Abertillery. This new premises would sell all photographic requirements and chemicals etc and was part of his chemist shops along with Medical Hall, Church Street, Blaina and Six Bells. The manager of the Camera House was Mr William Henry Bunney. Mr Bunney was a native of Winchester and came to Abertillery in 1908. He left the area in 1936 and resided in Bristol. I don’t know why the Camera Club didn’t stay in the Station Hotel or at the Railway Inn as in September 1922 the club announced that their new headquarters were at the Glasgow Assembly Rooms, Abertillery and their chairman was at 10 Ty-Bryn Road, Abertillery. In October 1923 Mr Joseph Cuthbert of Gordon House, 23 Alma Street, Abertillery sadly passed away at the age of 69 years. He had been to a meeting and came home to have a bath, he ran the hot water and sat on the side to take off his socks, at which point he lost his balance and fell into the scalding water. His daughter came to his aid but he passed away from his injuries the following morning. His wife Mrs Elizabeth Cuthbert had sadly passed away earlier in December 1919. In September 1924 it was announced that during the winter sessions of 1924-25 season the photographic society would hold meetings at the chairman’s home at 10 Ty-Bryn Road and also at 49 Alma Street, Abertillery. After this date the camera club must have folded. In May 1929 a meeting held at the Prudential Chambers, Abertillery, Mr W. A. Bolingbroke of 45 Marlborough Road, Abertillery presided, he proposed that the old photographic society be re-formed and be called “The Abertillery Camera Club” Mr Ivor Jones offered the use of a dark room. In April 1931 the Old Tylerian Association formed a camera club at the Intermediate County School, Abertillery. In April 1934 Mr A. S. Summerhill of 10 Cromwell Street, Abertillery, won £5 in a “News Snap” competition organised by the London Paper. Mr Summerhill was the secretary of the photographic society. Mr W. A. Bolingbroke of 45 Marlborough Road, Abertillery became secretary of the district hospital. Points of interest – At the outset of photography is was a relatively dangerous practice, with the chemicals for the development and the use of explosive powder to produce the flash procedure etc it had its risks. In June 1899 at the launch of the yacht “Columbia” from Bristol, Rhode Island U.S.A. in front of 5,000 spectators a young boy was killed and two were injured when a photographers flash exploded. In January 1908 the Sultan of Morocco was reportedly a keen amateur photographer. His aides told of how he had spent over £6,000 pounds on camera equipment and photographic apparatus etc. His new hobby had cost him a fortune. In March 1911 at the University Patents Bureau Ltd, 20 Copthill Avenue, London E.C. listed Patent’s No15.795.1. for Mr H. J. Hodgson of 27 Cronbrook Street, Cathays, Cardiff, an invention for daylight developing of photographs. It was described as being a combination of a developing tank, a rotating multiple plate carrier and fixing tank with a device to transfer the plates from the carrier to the fixing tank in daylight. On Friday 14th August 1914 an amateur photographer was talking photographs of the Crumlin Viaduct, Crumlin. Unbeknown to him the structure was being guarded by men of the National Reserve, he was arrested and taken into custody on suspicion of spying. He was interrogated and released after the army had accepted he was not a German spy. In August 1923 an American invention, labelled the “Thinnest Pocket Camera in the World” was put up for a patent. It was reported to have been a half of an inch thick and weighed 12oz. 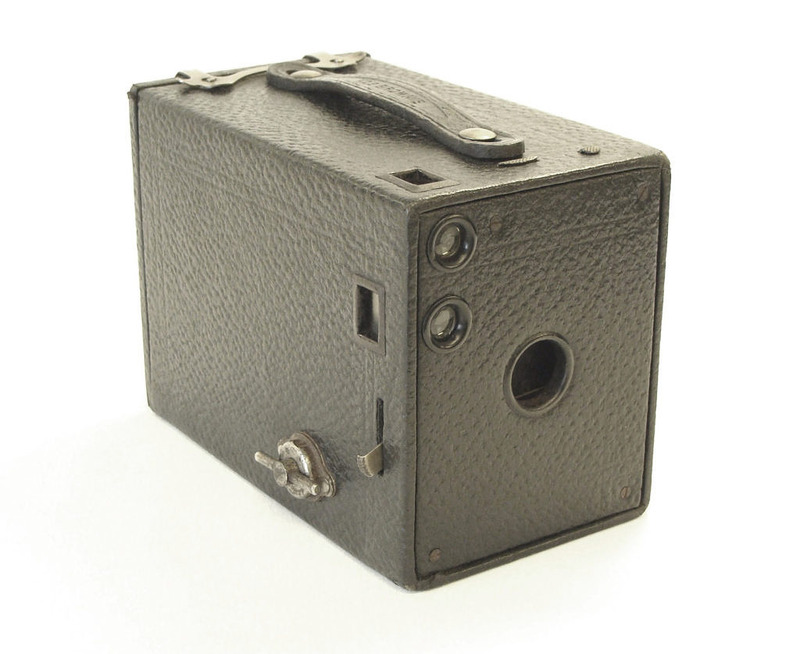 It had a large aperture lens which produced pictures as large as 4 and a quarter inches by 3 and a quarter inches. In 1933 Mr A. L. Cranch became X-ray technician to the King Edward VII Welsh National Memorial Homes for tuberculosis. On February 28th 1933, at the Ebenezer Lecture Hall, Abertillery, in his capacity as the technician he did a cinematograph and lantern lecture demonstration of radiographs of colliers lungs, showing the effects of coal and stone dust. In May 1933 it was announced a large infra-red panoramic photograph of Cardiff & District measuring 14′ feet 6″ inches long taken by Mr A. L. Cranch late of Abertillery, was exhibited at the Illford Galleries, London, Royal Society Burlington House.